If you are an Individual, Student or an professional and if your answer to the below mentioned questions is "YES" - Non Degree programs might be the best choice and only available option for you. You are running short of time due to hectic schedule? Your financial commitments are an area of concern? You want to just address situational requirement by educating yourself without a degree as of now? Are you in search of something that is poles apart from the usual degree program? You believe in “World as it is” understanding that gives you the liberty to tour or be employed outside the environment of an educational setup? Are you the student or professional who is fascinated to educational learning but is skeptical about English language proficiency, or concerned towards the tenure to be dedicated and financial obligation that happens to be the prerequisite for a degree program? 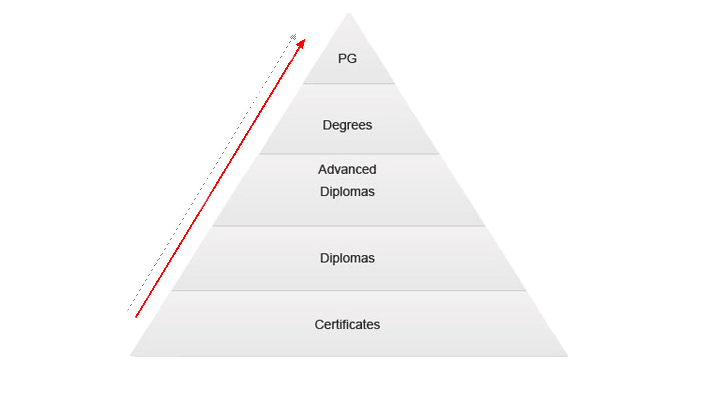 This diagram will help all to understand the different stages of education…. Students falling in the faculty of non-degree, mostly are the once who do not attend either to attain a degree or getting into a 4-year school. These students/professionals may take a course or two from some of the best online colleges and universities; as might be their boss wants them to further their education, or they need to become skilled at something to get ready for a new task/career, attaining new high paying jobs or at the most they are curious about any subject or segment. Non-degree category students are mostly not on the priority list in terms of registration. These students need to wait for all the degree-program students to get registered on priority and preference, where chances of situations of seat availability are fairly less in a particular segments/class/faculty. This program suits those individuals who care to have an official document or certificate at the end of the program; however are not able to dedicate the needs in terms of time for a full degree. “Certificate” as such does not carry a prominent meaning U.S. education system; however this has many options to suit your requirement including graduate, undergraduate or no academic credit at all. At times the certificate might simply authenticate about a meticulous professional or vocational expertise has been attained or accomplished. Few schools make certificate programs further widespread at the graduate stage. Often one educational year, or one summer are planned with enhanced intensity of studies to complete the curriculum. Generally graduate certificate curriculum often provides credit towards a degree (if in case one intends to accomplish later), providing you with ample education making you eligible to attain the selected profession. Most of the universities facilitate students to attend lectures/classes on campus though they are not enrolled for a degree program. One is not entitled to any credentials at the end of the program but gains lot of knowledge and understanding. Many universities provide the opportunity to practice your own interests and choices of courses for a semester or a year without formal entrance into a degree program – matriculation. Students after accomplishing their graduate study can get into postdoctoral research or other openings with university departments or specific faculties who have common interests like yours. Eligibility requirements for graduate-level non-degrees may differ institution to institution. One can also check catalogues or contact admin office for opportunities such as "Non degree or visiting students" position at the institute you might be interested in. There are temporary training programs which include concise work knowledge in the form of qualified internships. Internships help students and aspiring professionals to attain practical experience in specific field of concentration without any vow to a work or vocation. It also helps you to develop acquaintances with those who might be of great help in future at the inception and growth path of your career. Some internship is on hand for public who are not formally enrolled in a school’s educational agenda, and it may be likely for instructor to put together a position on demand and/or with a supplementary fee. Summer is the time when many U.S. universities open their doors to course for both non-students and their existing students. There might be few basic requirements such as English language ability; however the applicants in such summer courses generally do not have to clear any painstaking and complex admission process unlike a degree program. Summer classes can be compared to crash courses as compared to those existing during the regular educational year, covering the syllabus in approx eight weeks unlike the curriculum of a thirteen- or sixteen-week semester. They also serve as non-degree pre-professional programs. Classes are usually smaller, enabling enhanced attention and contact with faculty and fellow members. However, summer course works may lack at some basics such as student advising, tutoring or even housing; which happens to be a inevitable part of the usual academic year. There is a long list of short-term educational programs being offered across the U.S. which are not intended to consequence in a degree; instead they might lead you to the best non-degree careers available in USA. Looking out for appropriate career information for non-degree seeking students becomes mandatory as they stand out of the pack. Continuing non-degree programs and non-degree certification programs are intended to put together and upgrade practical and certified skills. Courses enabling one to achieve varied career requirements are presented by different schools and universities. However a considerable increase in the number has been noticed of business houses, private organizations, government agencies and associations which are equipped and specialized in offering short-term training.